JERUSALEM (AP) — Widely unpopular around the world, President Donald Trump can take solace in the adulation of Israel’s Benjamin Netanyahu, who showers him with praise and even holds his tongue over issues Israel might normally complain about. Trump provides the nationalist Netanyahu with a degree of support he rarely enjoys in the West. Several days ago, he pleased the prime minister mightily by refusing to certify the nuclear deal with Iran. Netanyahu was one of the few voices around the world who hailed the move, along with Saudi Arabia. Beyond a confluence of interests, Trump and Netanyahu seem to share a sort-of outsider status and a gift for populist stratagems that outrage their countries’ more liberal establishments while delighting their bases. In recent months, Netanyahu has responded to a series of corruption investigations with Trump-like attacks on Israel’s media, law-enforcement, judiciary and other so-called “elites” he believes are bent on his removal. There is some concern in Israel that although Netanyahu may benefit from the approach, in the long-term Israel might suffer from too tight an alignment with the mercurial American president. Chemi Shalev, a columnist for the liberal Haaretz daily, said Israel risked being cast as the “fall guy” if a potential U.S.-Iran clash goes bad. “When things get complicated, as they always do, it will be easy to point an accusatory finger at Netanyahu and his country,” he wrote. 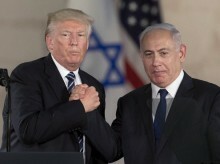 Greatly dependent on the United States for its support in international forums, and benefiting from generous economic support, Israeli leaders have traditionally sought the good graces of American presidents both Democratic and Republican. But the bipartisan approach frayed under Barack Obama. Netanyahu was very close to Republican figures and had an unusually icy relationship with the president, highlighted by an extraordinary 2015 speech in Congress in which he argued ferociously against the emerging Iran deal. In contrast, Netanyahu has been carefully considerate of Trump. On a visit to Washington he even implored critics to stop questioning Trump over the supposed anti-Semitism of some of his supporters. Netanyahu seems to genuinely relish the president’s approach to the Middle East, not only on Iran but also his hands-off approach to the Palestinian issue and Israeli settlement construction. Trump’s Mideast team, headed by his son-in-law Jared Kushner, is led by people with deep ties to the settler movement. Unlike Obama, Trump does not demand a settlement freeze, though he has urged restraint. Nor does he demand the establishment of a Palestinian state, breaking from two decades of U.S. policy. And while Trump has not carried out his promise to relocate the U.S. Embassy from Tel Aviv to Jerusalem, a key Israeli wish, he has not abandoned it. Netanyahu thus finds himself among a group of world leaders — from Egypt’s President Abdel-Fattah el-Sissi to the Philippines’ Rodrigo Duterte, whom Trump plans to meet next month — who seem to prefer a president driven by interest calculations more than human rights. But Trump would be hard-pressed to find a bigger fan. In recent days he called Trump’s move to withdraw from the U.N.’s cultural agency, in part over its alleged anti-Israel bias, “a courageous and ethical decision,” and praised him for having “boldly confronted Iran’s terrorist regime” with the decertification. Trump’s harsh criticism of the Iran deal, and his campaign pledges to scrap it, were welcome words for Netanyahu. In last week’s announcement, Trump largely echoed many of Netanyahu’s talking points. He criticized the agreement’s limited timeframe and failure to address aggressive Iranian behavior, including the development of long-range missiles and support for hostile militant groups across the Middle East. Unlike others, such as Germany’s Angela Merkel and Britain’s Theresa May, Netanyahu avoids confronting Trump on issues of principle as well. A case in point was August’s neo-Nazi march in Charlottesville, Virginia, and the uproar over Trump’s seeming defense of the actions of white supremacists. Netanyahu, who casts himself a leader of the Jewish people globally, is ordinarily quick to rail against anti-Semitism, but he waited three days before issuing a mild tweet. This week he lashed out at his hand-picked police chief for not quashing leaks into investigations regarding his conduct. The police say it will soon recommend whether Netanyahu should be indicted for various counts of bribery, fraud and breach of trust. Hendel said Netanyahu mainly calculates that “Trumpism” plays well with his nationalist base. “Trump is a tool to be used,” he said.